Hopefully I’ll manage to stay healthy this week. Week 2 was a mixture of a bad hamstring (which has improved) and a 24 hour bug on Saturday night which meant I cancelled my long Sunday run yesterday. 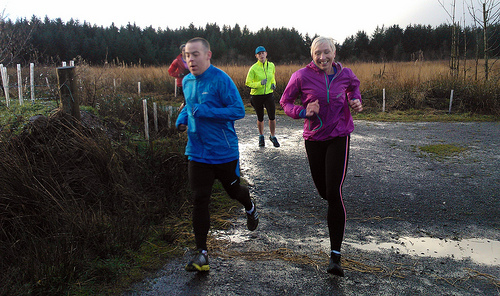 What I did manage on Saturday of Week 2 was an extra run at the Llyn Llech Owan parkrun. With a bit of pacing from a fellow Runner’s World forumite I managed a personal best of 28:02. Chuffed to bits. This was an extra run sanctioned by my coach and not part of the training programme. Tue 5.5M of 1M jog, then 3 x 1 mile at 10km pace with 3 min walk/jog then 1M jog??? Fri 3.5M inc 6 x 30 sec hill reps at threshold effort with jog recoveries??? In other news, the Asics 26.2 Nutritionist has been in touch on the forums asking for my weekend diet notes. 🙁 More on that in a later blog post.